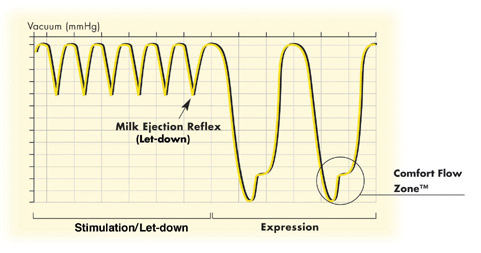 Featuring the original 2-Phase Expression® technology - only found in Medela breastpumps. Three stylish microfiber bags to choose from (On-the-go-tote, Backpack, or the Metro Bag) - Holds everything you need to pump. Battery pack (The Metro Bag's is in a soft pouch) - Lets you pump anywhere, anytime. 8 AA batteries not included. Single knob speed/vacuum adjustments - For comfortable pump settings. Removable cooler bag with contoured ice pack - Holds 4 breastmilk bottles and ice pack to keep breastmilk bottles cool. All parts that touch breastmilk are made without BPA - Safe for you and your baby. Research shows that babies have two nursing rhythms - an initial, rapid rhythm to promote let-down, then a slower, deeper rhythm once the milk is flowing. Using that research, Medela has improved on its #1 selling pump. The result is the Pump In Style Advanced Backpack, with an innovative two-phase pumping pattern called Natural ExpressionTM. This advanced pumping rhythm makes Pump In Style Advanced feel more like a baby than any other double electric pump. Includes Free UPS Ground Shipping! !Free Shipping offer is valid for all 50 United States and APO/FPO addresses. Orders to Alaska, Hawaii, and APO/FPO addresses are shipped via USPS Priority Mail. If you are in a hurry to receive your order, you may purchase an upgrade to UPS 2nd Day Air shipping for $25. Important: Power adaptor care -- Do not wrap cord of power adaptor around the plug body. Do not unplug power adaptor by pulling on cord. If damaged, immediately discontinue use and call Medela Customer Service at 1-800-435-8316. Comfort Flow Zone™ for maximum comfort and efficiency—gentle to the breast tissue. Adjustable preset combination of vacuum and cycles per minute. Self Expressions has been an Authorized Medela Dealer for more than 22 years (since January 1, 1995). To confirm our status as an authorized Medela Dealer, please visit Medela's "Dealer Locator" website, and type in our zip code, which is 32579. You will see Self Expressions at the top of the list, along with a link to our website. Medela 9V Portable Vehicle Adaptor #67174 New 9 Volt Vehicle Lighter adapter for all Pump In Style Advanced breastpumps manufactured in 2008 or later.